Like many other pieces, this short article reminds me of how much things don't change over the generations. 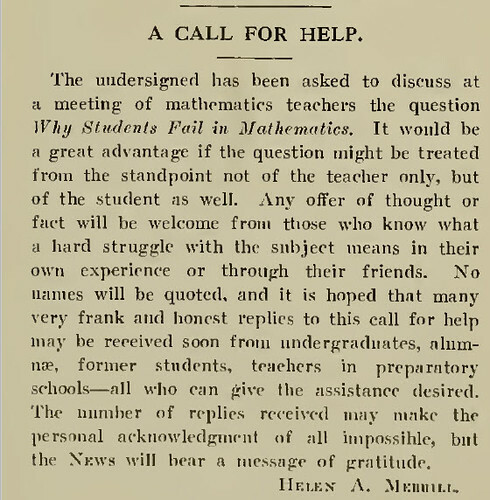 First, the article is concerned about rates of success in mathematics; something we still struggle with in colleges. Then, of course, it raises the question about asking and engaging students about why they may or may not succeed in this area. We still struggle with relying on what we suspect as instructors to be the issue and hearing what students believe to be the problem. And then we also often look towards one solution as opposed to multiple solutions when trying to solve how to improve success in a singular area of study.